Do you know your company´s value? ONEtoONE undertakes high-quality valuations for sellers, buyers and other investment banks. 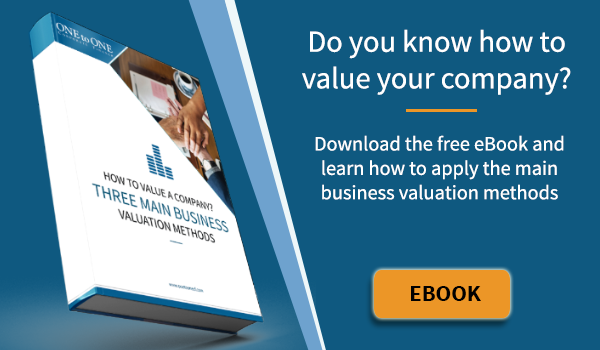 Having an accurate and comprehensive company valuation is very useful as it provides detailed information on the variables that underpin a business’s value. It also helps to gauge the impact that an improvement or deterioration of each of these variables can have on its value. In a corporate transaction, drawing up a valuation is a fundamental step in preparing a good negotiation and maximising company value. It must be well thought-out, logical, and include numerically based arguments. Why do you need a valuation if you are a seller? The valuation is a negotiating tool which will assist in the negotiating process. A clear, thorough valuation supports effective discussions and rational arguments with the interested party(s). 1. It will allow you to know the true value range of your business. 2. It will help you to understand the strengths and weaknesses of your business, something especially important in the lead up to the sales process. 3. It will allow you to understand the variables which underpin the value and the impact that potential synergies with the acquirer will have on its future value. If we negotiate well it will allow us to obtain a large proportion of these synergies. Why do you need a valuation if you are a buyer? If you are a buyer, you should not accept the seller’s valuation; you should do your own. It will help you to understand the company in depth and spot angles for negotiation. 1. Given that many sellers’ judgment of the value of their business is clouded by emotions, you will only be able to demonstrate its true value with a rigorous valuation. 2. To understand a business’s value it is important that you know how to assess its situation and the trends in its financial statements. 3. Analysing the company’s financial history will help you to see how the company has performed, its current state, and where it is heading. 4. You should study the cash flow and what is to be paid out, so that you can adequately structure the offer.